The Grand Duchy of Baden was one of the smaller German territories and was amalgamated with Württemberg in 1952. However, both states had a long dynastic history and today the head of the Grand Ducal Family Margrave Maximilian of Baden can celebrate his 80th birthday. Margrave Max of Baden and his wife, Margravine Valerie, née Archduchess of Austria. 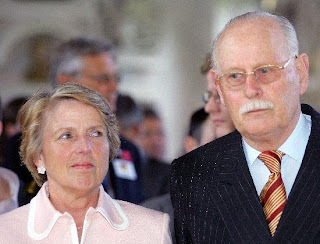 Prince Maximilian Andreas Friedrich Gustav Ernst August Bernhard of Baden was born on 3rd July 1933 at Schloss Salem, Salem, Germany, as the eldest son of Margrave Berthold of Baden and Margravine Theodora of Baden, née Princess of Greece and Denmark. Through his mother, he is the nephew of Prince Philip, Duke of Edinburgh and is first cousin to Charles, Prince of Wales. On 30th September 1966 he married Archduchess Valerie of Austria. The couple has four children. Hereditary Margrave is Prince Bernhard of Baden (*27th May 1970). Lunga vita alla granduca le dinastia, viva la Germania.